Tunisian protesters burned down a regional national security headquarters near the Algerian border, prompting authorities to send in troops after police retreated, witnesses said, as unrest over prices and taxes continued nationwide. Over 300 protesters were arrested overnight and the army was deployed in several cities to help quell violent protests in Tunisia seven years after the overthrow of Zine El-Abidine Ben Ali in the first of the Arab Spring revolts. In Thala, near the Algerian border, soldiers deployed after crowds torched the region’s national security building, forcing police to retreat from the town, witnesses told Reuters. Tunisia’s unity government - which includes Islamists, secular parties and independents - has portrayed the unrest as driven by criminal elements, and Prime Minister Youssef Chahed has accused the opposition of fuelling dissent. Rejecting that accusation, Tunisia’s main opposition bloc, the Popular Front, called for a major protest in Tunis on Sunday to coincide with the seventh anniversary of Ben Ali’s fall. Tunisia’s Football Association said it was postponing all weekend matches because of the disturbances. Anti-government protests have flared in a number of Tunisian cities and towns - including the tourist resort of Sousse, since Monday against price and tax rises imposed to cut a ballooning deficit and satisfy international lenders. While Tunisia is regarded as the only democratic success story in the Arab world, it has also had nine governments since Ben Ali’s overthrow, none of which have been able to deal with growing economic problems. 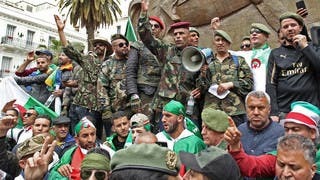 The army has been deployed in several cities, including Sousse, Kebeli and Bizerte, to protect government buildings that have become a target for protesters. “Three hundred and thirty people involved in acts of sabotage and robbery were arrested last night,” Interior Ministry spokesman Khelifa Chibani said. That brought the total number of detainees since the protests began to around 600. “What is happening is crime, not protests. They steal, intimidate people and threaten private and public property,” he added. The 2011 revolt and two major Islamist militant attacks in 2015 damaged foreign investment and tourism, which accounts for eight percent of Tunisia’s economic activity. Unemployment nationally exceeds 15 percent, and is much higher in some marginalized regions of the interior. Annual inflation rose to 6.4 percent in December, the highest rate since July 2014.